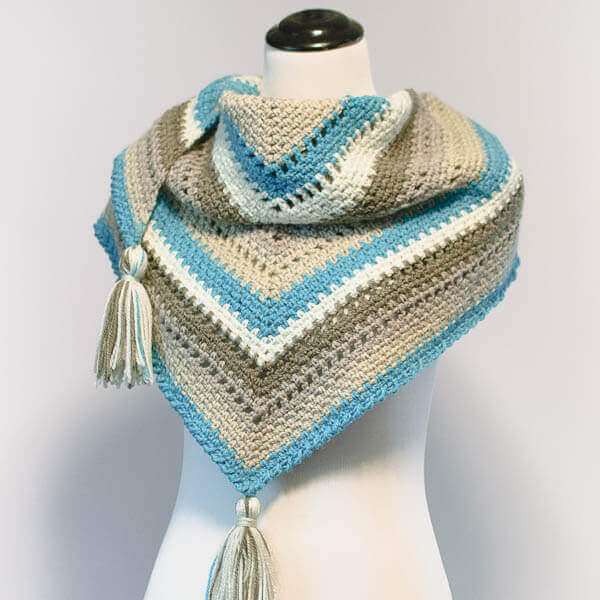 This shawl is soooo cozy … hence Cozy Striped Shawl Crochet Pattern. I just love the striking pops of blue! But don’t let the striping scare you off … there’s no color changing (or lots of ends to weave in!) because it’s all in the self striping yarn. I used Caron Cakes for this one. 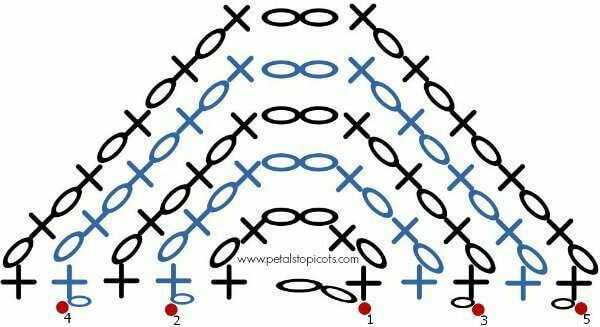 Row 1: In second ch from hook work [1 sc, ch 1, 1 sc, ch 2, 1 sc, ch 1, 1 sc], turn — 4 sc. Row 2: Ch 1, work 1 sc in first st, ch 1, 1 sc in next ch-1 sp, ch 1, [1 sc, ch 2, 1 sc] in center ch-2 sp, ch 1, 1 sc in next ch-1 sp, ch 1, work 1 sc in last st, turn — 6 sc. Row 3 (single crochet row repeat): Ch 1, work 1 sc in first st, ch 1, *1 sc in next ch-1 sp, ch 1,** repeat from * to ** to center ch-2 sp, [1 sc, ch 2, 1 sc] in center ch-2 sp, ch 1, work * to ** to end, work 1 sc in last st, turn — 8 sc. Rows 4 through 10: Repeat Row 3, ending with 22 sc in Row 10. Row 11 (double crochet row repeat): Ch 4 (counts as dc + ch 1 here and throughout), **work 1 dc in next ch-1 sp, ch 1,** repeat from * to ** to center ch-2 sp, [1 dc, ch 3, 1 dc] in center ch-2 sp, ch 1, work * to ** to end, work 1 dc in last st, turn — 24 dc. Rows 12 through 14: Repeat Row 3, ending with 30 sc in Row 14. Row 15: Ch 4, **work 1 dc in next ch-1 sp, ch 1,** repeat from * to ** to center ch-2 sp, [1 dc, ch 3, 1 dc] in center ch-2 sp, ch 1, work * to ** to end, work 1 dc in last st, turn — 32 dc. Ending Rows: Work 7 rows of single crochet row repeat. Edging Row: Do not turn, ch 1, work 1 reverse sc (also known as crab st) in first st, ch 1 *1 rev sc in next ch-1 sp, ch 1,** repeat from * to ** to center ch-2 sp, [1 rev sc, ch 2, 1 rev sc] in center ch-2 sp, ch 1, work * to ** to end, work 1 rev sc in last st. If you like, you can add some fun tassels to center and end points as shown in the shawl above or just leave it as is. See my tutorial How to Make Tassels Quickly and Easily. Caron Cakes are sold at Michael’s here in Canada. I have a lot of colors and at least 2 or three of each. Unfortunately I don’t have that one. I didn’t think I would like that one with blue and brown together. Now that I see your beautiful creation I realize I was wrong on the coloring. Back to the store I go again. Thank you so much for the pattern. Oh dear im so mad that i decided to get only 1 cake in this color, now do you think i can make it with just 1 roll? Hello 🙂 Unfortunately I don’t think one cake will be enough. 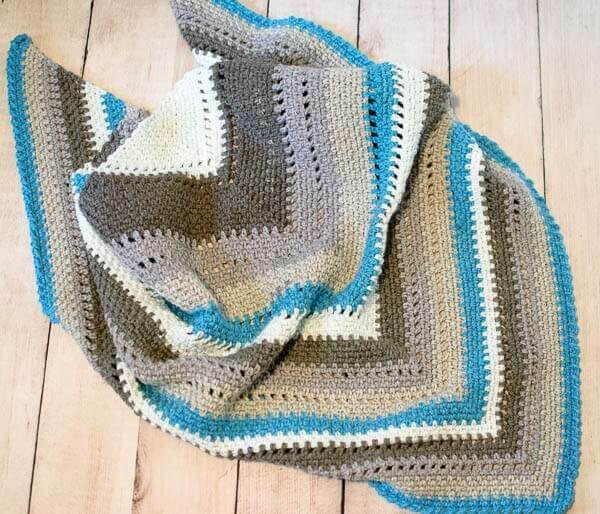 Perhaps you can pair it with some coordinating yarn from your stash for an even more unique striping effect! Just finished my shawl in ” funfetti”. Used the h hook as well, I probably crochet with a tighter tension ,used all of the yarn and improvised with the last few rows (double crochet,then single ,then double then the edging. Thanks for the pattern . Can you tell me how many single crochets go into round 16? I’m not sure how many to work into the large spaces from row 15. Row 16 should end with 34 sts. You will still be working the sc crochet row as before. Just finished this as a gift for my niece. It just so happens I was looking for a pattern to use my Cake Pop yarn. Loved that I could see how it was going to turn out and it is beautiful! Thanks for sharing this pattern. Ruth, when I can’t afford a specific yarn, I just do the same pattern in a yarn that is more affordable! Hi Ruth 🙂 Unfortunately, I am not sure how many balls you would need to make a smaller version. Since the yarn has color changes built into it, you could probably mix it with some yarn you already have on hand and it would look like it all works together. Your shawl is beautiful! 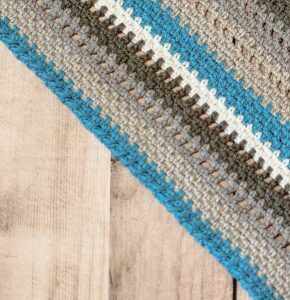 How do you ensure your color striping turns out so perfectly with self striping yarn? The striping didn’t always work out evenly across the rows. The linen stitch was very forgiving for this. For the grays, the color changes don’t really show. But the blue and white is a bit more noticeable. Beautiful shawl pattern. Can’t wait to see more patterns! When I can afford and have the time to work on this pattern, I’m going to do so. Thank you for all the great designs you have made. As always they are exceptional quality. Thank you, Mary! So glad you like it!! Thank you so much for the pattern. I don’t have a Michael’s near me and was sent two cakes of this awesome yarn by a friend. I didn’t know what to make with it and so?was pleased to see your pattern. Again thanks for the wonderful pattern. Can’t wait to try this yarn now! How wonderful! Hope you enjoy the pattern!! Do you have any ideas on getting this yarn sent my way? Thank you! Have you tried Wool a Warehouse in the UK. Service is really good.